The food allergy & gluten free community is a special one. We all have different stories, different experiences, different allergies... but one thing is constant: We all face challenges with food and advocating our, or our children's, rights each and every day. It's a family. An instant embrace. Within five minutes of speaking to a fellow parent or person with food related issues, there's an instant connection. Someone who "gets it", understands, knows what it's like. There's no judging, only educating and sharing. These are my peers. My fellow advocates. Fellow bloggers. Together, we can make a difference. And I am forever grateful to Jenny Sprague for having the courage and creativity to bring us together at such an amazing conference. 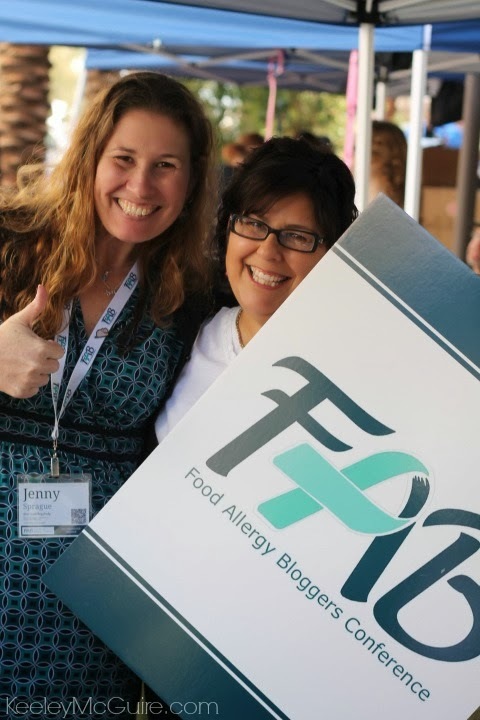 Jenny Sprague, founder of FABlogCon and blogger at Multiple Food Allergy Help, and Caroline Moassessi, blogger at Grateful Foodie & all around food allergy renegade! 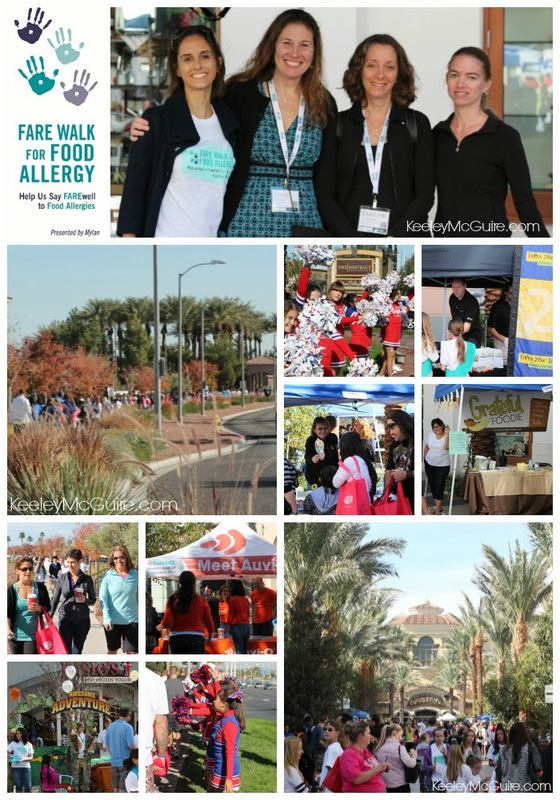 The weekend started with an early rise on Saturday morning for the FARE Food Allergy Walk in Las Vegas. I was so thrilled & honored to be walking with the #FABlogCon team. Just some of the photos I snapped during the FARE Walk event in Las Vegas. It was the perfect way to start off the conference weekend. Surrounded by families and friends supporting FARE, food allergy research, and education. There were amazing vendors that also had tents at the event: Mylan makers of Epi-Pen epinephrine injectors, Sanofi makers of Auvi-Q epinephrine injectors, SunButter Sunflower Seed Spread, SunCups, Enjoy Life Foods, 1-2-3 Gluten Free, WowButter, So Delicious, Van's, Dreamy Desserts, and many many more. Handing out samples, coupons, and information. It's a great place to learn about and try new to you products! After the walk, we had a few hours to eat and recover back at the hotel, while other attendees of the conference started getting into Las Vegas slowly but surely. That evening we had a "Meet & Greet" with dinner & cocktails. It was so great meeting so many wonderful people whom I've connected with online for the past 3+ years and some new contacts, as well. The evening also included special guest speakers, such as the Senator from Nevada and Dr. Eric Edwards (he and his twin brother created Auvi-Q). Having an "Opening Night" social hour was a great ice breaker to meet fellow bloggers and be able to associate faces to blog/ website titles for the upcoming conference sessions. The next morning featured a delicious allergy free breakfast buffet, lots of coffee, and then immediately into session breakouts. The conference offered two tracks - One focused on blogging and the other focused on food allergy education & advocacy. Bloggers were given the ability to go between the different tracks, which was great - you didn't have to just pick one track and stay with it the entire conference. My first session was called "The Company You Keep" and was lead by Tess Master "The Blender Girl", Joel Warady CMO of Enjoy Life Foods, and Annelies Zijderveld Online Community Manager of Attune Foods. The session focused on building your blog, what companies look for, and focusing on your end goals. I loved this session. It's not only beneficial for bloggers just starting out, but any one looking to make their brand stronger. Why is this important? Well, it affords you not only more opportunities but when your brand is stronger, so is your voice. It gives bloggers the ability to be stronger advocates and reach more people. And that's the ultimate goal. My next session was "Monetizing Your Blog" with Alisa Fleming of Go Dairy Free. Don't let her small stature fool you, this woman is a power house! Her session went right along with the first ("The Company You Keep") and was great to build upon my notes. Some key points to remember are even though, as a blogger, you are looking to financially support your blog & goals, keep true to yourself - don't advertise products you wouldn't use or stand behind. Our blogs are our platforms, our voice - so stay true to who you are. The session was also great about reminding us to prioritize, be responsive, and nurture our business relationships (it was at one point, I think by Tess Masters, compared to "dating"). I also got a copy of Alisa's book "Go Dairy Free" during the session which I am thrilled about! It's the Ultimate Guide and Cookbook for Milk Allergies, Lactose Intolerance, & Casein-Free Living. "The Art of Recipe Development" was one of the sessions I had been looking forward to coming into the conference. As a lunch packer & recipe maker, I was eager to hear the wisdom of three of the women I admire most in allergy-free cooking & baking: Cybele Pascal, Colette Martin, & Kelly Rudnicki. For those of us who cook allergy & gluten free, here are some good reminders: When a blogger posts a recipe on their site, remember that baked goods are a science. It's chemistry. One substitution changes the entire formula. So if you sub something for your allergen needs, big or small as it may seem, please be considerate to the author and don't leave them hateful comments that their recipe was a failure. It happens, believe me. Be considerate to the fact that in baking, substitutions greatly effect the outcome. When it comes to main dishes or entrees, however, those can be flexible! That's where you can be creative and adapt them more easily. The session also focused in writing tips, finding our own styles, and copyright information. One more tip: Invest in an oven thermometer! All oven temps differ and this can greatly effect the outcome of a recipe you are following or attempting to create for your own blog. Cybele Pascal actually uses two of them! I also loved all the light tips & tricks we reviewed, as well. It's dark now when I leave in the morning and by the time I get home *sigh* which is no good for good food photos. I hope these ideas will help! Susan started the session wonderfully, breaking down the steps on how a book becomes a reality: First you start with the idea, then a proposal, then you need an Agent & Social Media Presence. From there it would go to a Publisher, you'd get a contract, money, timeline, etc... (of course, this could all happen quickly or take up to ten years). What the session lacked, for me, was what the title insinuated it would be about "How to Self Publish". I didn't walk away with any of that knowledge. It was more a session about what to look out for, issues you can have working with a Publisher (it's not all rainbows & sunshine), and also the benefits of working with a Publisher as opposed to self-publishing. Though great information, it was just not what I was hoping to take away or what I thought it would be focused on. Day 2 lead right into a great morning session called "Make it Pretty" with Mary Fran Wiley of FrannyCakes blog and the Chronic Positivity Project. By day, Mary Fran is a web designer for a pretty big company in Chicago (she's kind of a big deal! ), so she was the perfect person to lead this session. Mary Fran broke down what all the html/css code gobbly-gook (as I call it) means. I know how to change and add things to my blog, but didn't know the "whys" and "what it means"... just that it works. :) So, now I feel I have a much better understanding for "how my blog works" and if something goes wrong, how to fix it. Mary Fran was gracious enough to post a link with copies of her slides from her session at #FABlogCon which you can see here: http://t.co/w8yRx4wg7G Though you won't get her audio which explains it more thoroughly, hopefully it can help! I took my next session with Ritesh Patel about Social Media. He had great tips on using our social media tools, share apps, posting links, and keywords properly. The afternoon began with Henry Elhrich, the keynote speaker, discussing new research & developments with food allergies. If you aren't familiar with Henry and the work he's done in the asthma & allergy world, my friend Caroline at GratefulFoodie did a great post about him. You can read it by clicking HERE. Next up was "Getting Heard: Being an Effective Advocate". Another session I was excited for! I hunger to be a stronger advocate, but like many of us, struggle where to begin and how to go about it. Nona Narvaez, Caroline Moassessi, & Laurel Francoeur Esq. lead the session. These women are RENEGADES. They have fought in their states for allergy laws, stock epinephrine, and children's rights. I was honored to be in their presence and listening to their stories. "They can't make a good law unless we tell them what we need." I wrote this down in my notes and don't remember which of the three women spoke it... but it's so true. And why it's so important to have that clear message and goal when you start this process. After this amazing session, we dove right into "Filling the Gaps" with Jan Hanson, Veronica LaFemina of FARE, Nona Narvaez, and Cheryl Virand of Freedible, as the moderator. What are "the gaps"? Right now, two of the biggest ones are language barriers and financial needs that keep families from getting the proper education and medication they need to effectively learn about and handle their food allergies. Another "gap" is clinical care. I've heard so many stories from families being handed just a tiny pamphlet or "just avoid food ___" when they're diagnosed. Many are not told about the severities, how to read labels, or how to properly use their epinephrine, or even when to use it. Right now FARE is working on a new patient packet for allergists to give out. An "All You Need to Know", if you will, regarding education, living with allergies, and connections. It will take time to get these into everyone's hands... but it's a start. That's why we as bloggers are so important to our fellow food allergy families - to share, to advocate, to teach. I have learned so much more from my online peers than I ever did from our pediatrician or allergist. Another "gap" - THEY JUST DON'T GET IT. How many times have you felt like a broken record to a school, daycare provider, or even a family member? More than I can count. Educate the Educators. "You don't know what you don't know." This includes working with the PTO, letters to the school community, peer education (classmates). One great idea they gave (that I hadn't thought of) is asking for food allergies & special diets to be a topic during a Staff Development In-Service Day. This is the perfect time to have the attention of the entire school staff and to educate them properly on handling food allergies and special diets and also emergency epinephrine use in their classrooms. Remember, this is a "quiet success" but has a mushroom effect (as Jan Hanson put it). We're raising the bar, setting standards, planting seeds... it will lead to future success and growth! 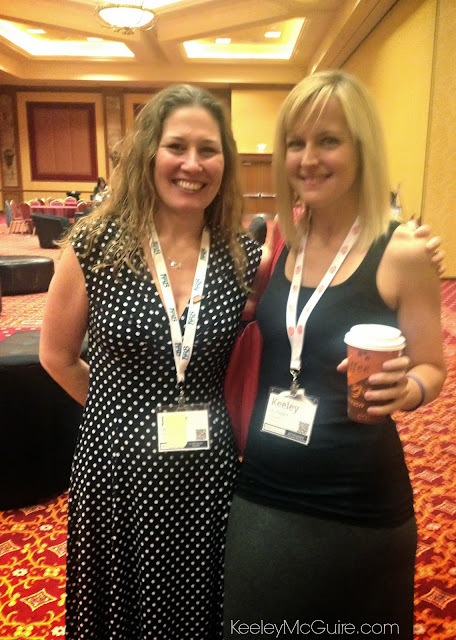 Jenny Sprague, Founder of the Food Allergy Bloggers Conference. Love this woman! If you have the opportunity to attend FABlogCon next year, I highly recommend it. 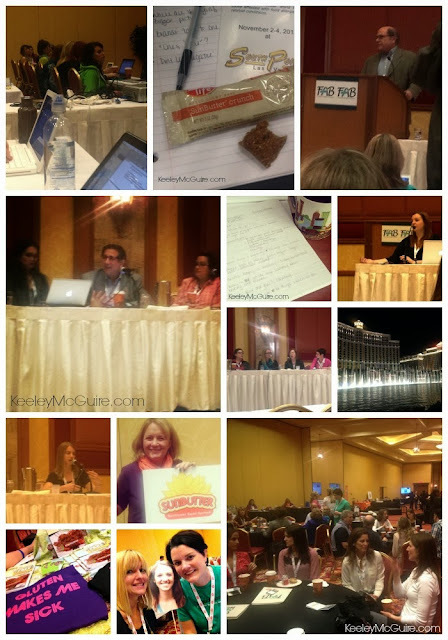 I personally cannot wait to go again and learn more from my blogging peers and food allergy advocates. I'm in awe of the fantastic work Jenny & Homa did in putting this all together. There were many quiet volunteers, as well, that spent countless hours helping make this event happen. A special thank you to all the vendors and sponsors of this event! The swag bags were crazy amazing. My daughter is swimming in food allergy love! Without you, this conference may not have been possible. Another special thank you to Chef Keith Norman of the South Point Hotel & Casino. You and your team did such a fantastic job of handling everyone's dietary needs and allergies during the event. I heard time and time again from attendees "it's so great to go somewhere and be able to eat everything!" As someone who's on a special diet and has a daughter with anaphylaxis to foods, thank you! To all the lovely bloggers I met during the conference, or had met before but was able to see again, you are all amazing people. Keep on advocating. Keep on sharing your voice. Keep on following your mission. Don't give up. Don't get discouraged. Even when we might feel small, remember the conference. Remember what it felt like to be around all those people, in the same fight as you. We are a community. A family. Be strong. Be bold. A special from KeeleyMcGuire.com to EasyLunchboxes and Maplehurst Bakeries for your support for our FARE team and the ability for me to be able to attend the Food Allergy Bloggers Conference. You are truly amazing! Thank you for understanding the importance to advocacy and making stronger voices in the food allergy community. Great re-cap Keely! Till next year sista friend! I loved the detail in this post as well as all the photos. And thank you for being honest about your perspective on the sessions, I think that there is always room for constructive criticism. Maybe we need a lunch packing session next year? ;) Thank you so much for coming, it was a real pleasure to meet you!!! Great post! I know that I was relatively unaware of the severity of food allergies until your blog. You are doing an excellent job of advocating for and teaching others about food allergis. This is a fabulous and wonderful recap of the conference! Your notes fill some of the gaps in my own notes because I couldn't type fast enough! It was wonderful to meet you and I can't wait until next year! Great recap babe! So good to see you! Wow, what a great recap! And I am very happy that you learned something from my sessions!! 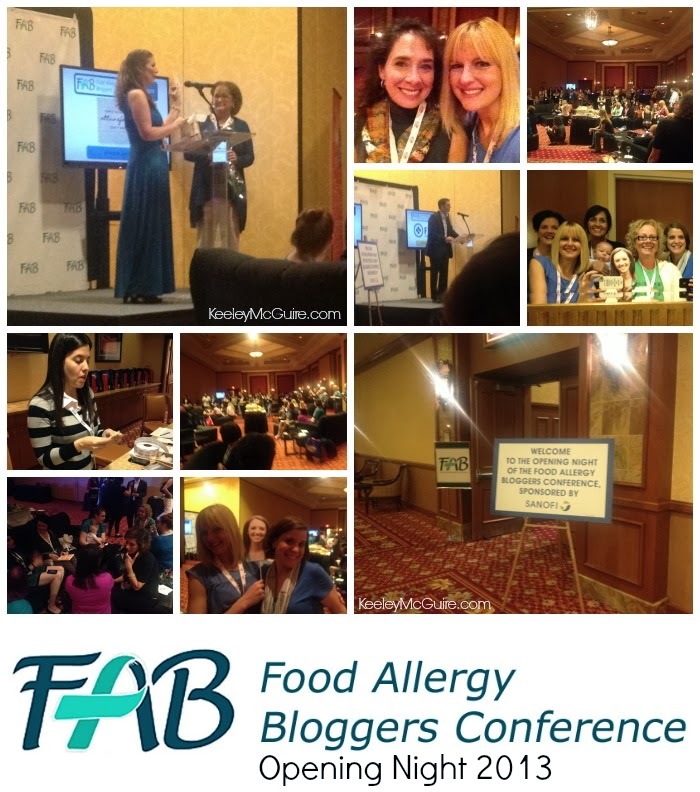 What a neat idea for all of you food allergy bloggers to get together and network, as well as share ideas. Keep doing what you are doing, I know you are helping a lot of people who suffer with food allergies. I am currently seeing an allergy and immunology specialist who also deals with food allergies. I was SO sad that I couldn't attend. Thanks for the great re-cap. I hope to attend next year!